Enhance your lessons with free video presentations from the Smoky Hill Museum’s Educational Lending Library. Expose your students to quality, engaging presentations offered by professors, historians, authors and more. This is a working, growing library with topics such as the impressive DC3 weather project, animals of the Pleistocene, cattle trails, the history of Camp Phillips, Schilling Air Force Base and more. Available to educational entities only. 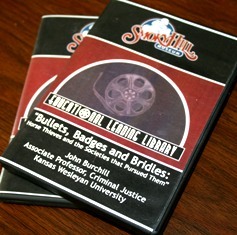 Contact Nona Miller, Curator of Education, to check out a DVD by calling 785-309-5776 or email nona.miller@salina.org. This list is constantly growing. Please contact Nona Miller for the most up-to-date list. Beans, Buffalo, Bacon, Birds, Berries & Biscuits: What did they eat on the Santa Fe Trail? Understanding the Maya and the 2012 Apocalypse: Fact or Fiction? This very visual presentation shows many of the iconic images taken by F.M. Steele. Dr. Hoy also provides historical background and important information about both the photos and the times they were taken. Everyone who traveled the Santa Fe Trail had to eat. Leo Oliva uses the words of the men and women who were there to share about food on the trail - the foods eaten, the preparation and the dining experience. Kansas was the center of operations for many bands of horse thieves as well as anti-horse thief societies. Find out why in this visual and gripping presentation. Learn about individual horse thieves, gangs and what was going on in society at the time. During the harsh, stark and often bloody reality of the Civil War, field hospitals and surgeons did their best to stop disease and mend broken and bullet-ridden bodies. Join Dr. Michael Monaco as he discusses the medical practices of the Civil War. Join Jim Gray for this exciting story of cowboys, cattle and the steak on your plate, including how Ellsworth and Salina fit into the drive. Interesting stories and great information. Using numerous photos and memorabilia, Tim Roggers, executive director of the Salina Airport Authority, introduces you to twenty well and littleknown facts about the base. Also see a sneak peek of the Wings Over Salina Aviation Experience. Dr. Blakeslee talks about the travels, interests, trading habits and lives of earlyPlains People. He's especially interested in their study of and understanding of meteors. All aboard! In this engaging video, Kansas author Robert Collins shares some of his extensive knowledge of area train lines. This video is driven by audience questions and topics covered including the Doodlebug, the train on display in Salina’s Oakdale Park, the Andover train robbery, Harvey Houses, Native Americans and more. The prairie has always had its share of interesting and frightening animals. Join Dr. David Burnham as he discusses animals of the Pleistocene Epoch, including camels, mastodons and saber-toothed cats. This is a highly visual video. Join Dr. Patricia Ackerman as she shares stories and photos she discovered during the process of archival research and the writing of her book, Marymount College of Kansas: A History. Learn about unique, beautiful and little-known Kansas travel destinations - just in time for summer vacation! Join Audrey Kalivoda as she explores the history behind featured places and shares about the process of making Kansas: The Center Of It All. What was life really like in the 1930s? Join Dr. Robert Weems as he explores some of the major factors that caused the Depression and how it affected the economy, especially workers. He'll also discuss help, from the gov't and from Hollywood. KS women gained the vote in 1912, eight years before Congress passed the 19th Amendment, granting voting rights to all American women. Join Diane Eickhoff as she explores the many obstacles Kansas women had to overcome on their way to the voting booth.